This interview is absolutely stunning. As you know, I read and watch daily to pick out information that I believe is vital to learn in order to interpret what is happening in the world. This 54-minute video is one of the best I’ve watched in several weeks. It is presented on the internet show, Dark Journalist (who is Daniel Liszt). His interviews aren’t always in line with my perspective, but they are always engaging. His view is, by no means, an evangelical point of view. But he offers a consistent vantage point with what many (like myself) who follow the “alternative media” (where truth resides much more frequently than not) assert to be the real story; that is, what is really happening behind the scenes. Catherine is probably the most informed, intelligent, articulate and transformative thinker out on alt media today. She was the Under Secretary for HUD under Bush (that’s the federal department of Housing and Urban Development). Her interviews are many and they are gold. Dark Journalist probably has the most consistently high-quality guests of any show out on the internet today. Daniel is one of the best interviewers because he studies the topics and asks relevant questions. He provides both free and paid-for interviews as part of his subscription service. This interview is the second of three. This was intended to be a “for paid subscribers only” but the interview was so insightful into current geopolitics (world affairs) that he decided to make it public now. I’ve watched the first interview as well, but believe this second one is the most relevant for my audience. First: Two civilizations exist in the world. One is visible and one is invisible. It is discussed here as an “assumed truth”. It refers to the view that there are massive programs including “off world” activities with secret science that has been financed by the US (mostly) for three to four decades (the so/called black budget). The cover-up is so well-entrenched it is hard to see how it will be made public (this would be the “disclosure” event many in the UFO community discuss). This black budget is now at least as big as the publicly-disclosed budget. Former Secretary Donald Rumsfeld admitted it on 9/10/01. In his press conference, he mentioned the Pentagon is missing $2.3 Trillion that they can’t account for. This money drain is trillions annually. Where this money comes from is itself a fascinating story taken up by Joseph P. Farrell in several of his books about the “secret, break-away civilization” (a phrase originally put forth by author/researcher Richard Dolan). Of course, the day after Rumsfeld’s conference was 9/11, and any memory of his admittance was buried beneath the rubble of the Two Towers (and Building Seven which much of the information about this second civilization supposedly was maintained). Second: Pedophilia lies at the feet of virtually all those in world power. All major power players are entrapped or willingly engage in destructive activities with children so that everyone is “dirty with it” and thus everyone has to participate in the cover up lest any one be exposed. This is the same principle of ensuring that everyone is guilty so that no one has a motive to spill the beans. We’ve seen this in a number of corruption scandals and popularly in TV shows and movies where “all cops have to be on the take” otherwise the honest cop will be chased out of the police department. Pizza Gate aka Pedo Gate was exposed thru Anthony Weiner’s laptop (the 65,000 emails grabbed by the FBI and the NYPD) and John Podesta’s emails discussing Spirit Cooking dinners and apparent rituals involving children are but the tip of the iceberg. The mainstream media, however, can’t touch this because it underlies virtually all major political and mega-corporate power structures. In the interview, Fitts argues these “revelations” were key to Hillary’s defeat. Millions understood that the establishment was out of touch and growing perverted if not outright wicked. Hillary was the establishment. She embodied these qualities. Trump, whatever his shortcomings, was viewed by over half the electorate as a hope for change. Of course, whether he delivers remains to be seen. Third, the intelligence services of the US have since Vietnam Nam run drugs to pay for black ops. See the Gary Webb story in the Jeremy Remmer movie, Kill the Messenger. The CIA is particularly dirty. Drugs are the downfall of humanity and a root cause of most poverty in the U.S. The whole sordid story of the Iran-Contra Affair, concocted in part and managed by Col. Oliver North (viewed by many as a patriot), was but one part of a program that began with sneaking drugs from Southeast Asia (Vietnam, Laos, and Cambodia) back to the U.S. in the body cavities of American soldiers killed in action (KIA) there. This has become a well-documented fact. What isn’t as well-known is who was behind it and why it was being done. The CIA’s “Air America” was up to their ear lobes in this rat line and it spawned later activity, such as Iran-Contra and then later the under-publicized Mena, Arkansas drug rat line (originating in South America) that (many believe) was founded by George H.W. Bush and William Jefferson Clinton (who were, with Hillary, partners in crime). Fourth, the central banks and the war economy is how the world turns. This has been so for almost 200 years. It was the basis of the Rothschild’s massive wealth gained by manipulating markets when Napoleon was defeated at Waterloo (June 18, 1815). It continues to this day. Globalism is based on the drive for a single world order and single currency. This is one of the most basic tenets in Bible Prophecy, the so-called Beast System, and the Mark of the Beast 666 (by which everyone must be marked if they would buy or sell). Among the alternate media, the belief about “untouchable” nature of the “banksters” is a given with proof offered up by almost everyone doing shows and writing articles on the topic of how central banking and a world economy based on continuous war undergirds the New World Order. The reference work of much of this was developed years ago by G. Edward Griffin, The Beast from Jekel Island, and is commended by no less than Senators Ron Paul and Rand Paul. IS TRUMP REALLY OUR HERO? Weaknesses of this interview are a blindness to Trump’s foibles. Donald Trump is a political novice, he is weakened by narcissistic tendencies, and he fails to have any real ideology underpinning his worldview. He does want to “make America great again” but doesn’t have a coherent plan to drive his vision. He is easily persuaded to do dumb things. He has surrounded himself by Neo-con generals and Goldman Sachs executives. Perhaps it is part of a secret grand plan. But it is more likely that Trump simply doesn’t have enough background in geopolitics and world history to understand the implications of what he is being asked to do. Despite this, if you understand the major points above you can see why the establishment e evil and must be targeted by enlightening the public. Only a massive awakening of the public can change the world. That is why everyone needs to face the music as uncomfortable as it is. With the modern advent of advanced satellites, invasive tracking technology, drone warfare and the development of a Global Smart Grid, many of their tools for dominance are in place as they weigh their options for consolidation of power! Fascinating, unnerving, complex and informative, you don’t want to miss this compelling Dark Journalist episode! 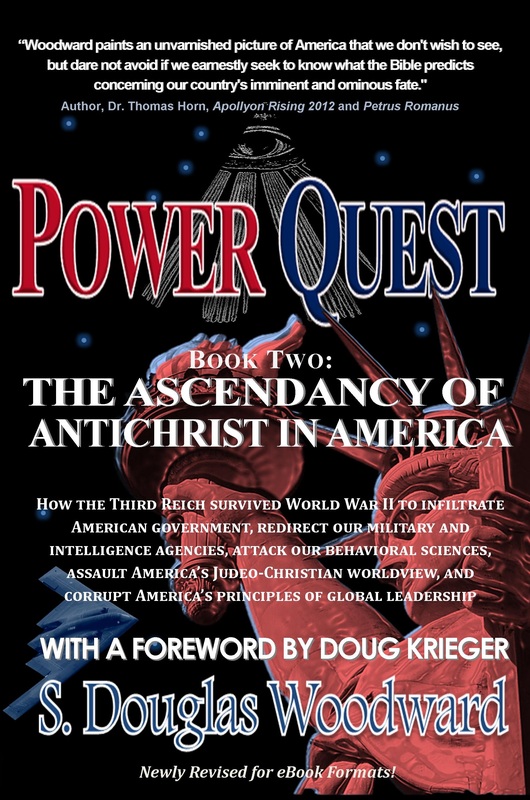 IF YOU WANT TO GO DEEPER, I strongly encourage you to consider purchasing two of my books, POWER QUEST BOOK ONE — AMERICA’S OBSESSION WITH THE PARANORMAL and POWER QUEST BOOK TWO: AMERICA AND THE COMING OF ANTICHRIST. And thank you for supporting my writing and speaking ministry. CLICK ON THE COVERS TO SEE THE BOOKS ON AMAZON. EXCELLENT RESEARCH, PRESENTATION, AND INFORMATION! Great read! If you’re like me and want to dig beneath the obvious, read these books by S. Douglas Woodward! I also purchased Power Quest Book One and would recommend you read both. Excellent research, excellent presentation, excellent information! I have learned more about world and United States history reading this than I thought I would. We have been lied to my entire life…+67 yrs! excellent compilation of information about the Nazi and other evil infiltration and control of the US govt. elected and unelected segments. Good book! Mr. Woodward’s thesis could be correct. Sadly, our country fits the profile and unfortunately one has to wonder how much of the wrath poured out will we personally have to endure. Very informative book!!!! Very eye opening. I wasn’t aware of how Nazis steered out government and social programs after ww2.